Sam Chapman, Heriot-Watt University and Camilla Thompson of Edinburgh University hosted a lively debate and discussion on ‘Power Generation: Rules and Tools for Wind Energy Accounting’. The workshop discussed best current practice in carbon accounting for life cycle carbon emissions from wind power and the operational impacts of the relationship between different generation technologies on a distribution network. Key issues were introduced which covered: the harmonisation process developed by NREL and how it’s methodology can be applied to developing frameworks; continued challenges in creating a standard framework; and grid and wind interaction through looking at marginal carbon offsets of wind power. A framework and review process is critical to decision making. There are levels of carbon accounting appropriate to different stakeholders and this must be reflected in developed guidelines. Stakeholders included policy-makers, consultants and researchers. Research was most presented by over half of the attendees but a larger number of private sector individuals was present than in previous workshops. This is seen as a good improvement since it has addressed some feedback from previous workshops. 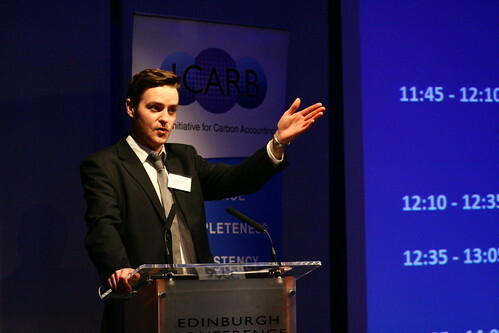 Scotland has very ambitious carbon reduction targets. This is leading to tough decisions on technologies and mitigation measures. While a large number of case studies exist in the energy sector relating to life cycle environmental impacts, these have been misleading in their variability. It has often proved to compare life cycle studies without better understanding the underlying assumptions. NREL’s Harmonization Project has made excellent inroads into reducing some of this variability. Open resources are now available from this project that will improve policy-makers’ confidence in life cycle estimates (en.openei.org/LCA). We can provide good examples of attributional LCAs now to base assumptions on. However, it is important to convey the importance of specific studies and be clear in all assumptions made throughout LCAs and in particular, consequential LCAs. There should be a move towards consequential LCAs in order to better understand effects to whole systems. The power distribution network is complex and marginal emissions rates, and confidence in them, are vital to better understand technological decisions. Work by Adam Hawkes of Imperial College London goes a great way to understanding potential changes to the supply network, based on demand-side decisions. Also, Camilla Thomson of Edinburgh University is providing interesting insight into grid interactions of wind power with traditional power generation. Whole system thinking is critical to energy and infrastructure assessment. Greater work should be done in hybrid life cycle assessment in order to incorporate cost-based information into LCAs. Analysis should recognise intricacies in material specifications, in particular in technologies with special requirements such as the steel used in nuclear power plants. More work into disturbance of peat land is still required by the Scottish Government in order to prevent potentially detrimental decisions. This was a specific call from Government. While the carbon calculator is good for preliminary results, the full effects peat disturbance should be better understood. The purpose of carbon assessment of power generation needs to be kept in mind throughout and the quality of information used must be clearly presented. Where consequences are assessed, clarity in the reasons for the study is important. Whole system thinking is critical to energy and infrastructure assessment. Consequential LCAs will be important to better understand changes brought about by decisions. Fourth year PhD student researching the carbon footprint of power generation systems. Currently concentrating on analysing electricity market data published by National Grid to estimate the carbon offset of intermittent renewables, such as wind power. She has also completed a detailed life cycle assessment of the Pelamis Wave Energy converter, with a comprehensive examination of the methodology and effect of practitioner assumptions. This entry was posted in Energy Presentations on May 6, 2013 by Ric.